Bernie Sanders: I led the effort against deregulation, but we lost. Bernie Sanders: We need a 21st-century Glass-Steagall legislation. Hillary Clinton: Committed to reducing corporate power not only Wall St.
Bernie Sanders: What kind of response would happen if Flint MI were white? Bernie Sanders: If we don't break up banks, we'll be bailing them out again. Hillary Clinton: Agrees that Wall Street and banks cannot get too powerful. Hillary Clinton: I warned corporations about wrecking the economy. Hillary Clinton: It's not just Wall Street; it's Big Pharma too. Bernie Sanders: Government should not be part of the death penalty. Bernie Sanders: Create criminal records for corrupt white collar criminals. Hillary Clinton: Death penalty appropriate for Oklahoma City bombing. Bernie Sanders: Student debt is crushing young graduates. Hillary Clinton: Experts vetted my college plan, and it works. Hillary Clinton: Half a billion solar panels in first 4 years. Hillary Clinton: Federal takeover of Flint water supply if state can't fix it. Bernie Sanders: Key doctrine: We can't do it alone; must work in coalition. Bernie Sanders: Encourage Saudis and Iran to work together, despite distrust. Bernie Sanders: Move forward with Iran with relations the long-term goal. Bernie Sanders: North Korea is run by nuclear-armed paranoid dictator. Bernie Sanders: I worry about Putin in Crimea but worry more about N. Korea. Hillary Clinton: Address arc of instability from North Africa to South Asia. Hillary Clinton: Obama trusted my judgment; I'll be ready on Day One. Hillary Clinton: Need more European contribution to defending against Russia. Bernie Sanders: Don't believe that unfettered trade creates U.S. jobs. Bernie Sanders: I disagree with Obama on TPP, but he's done a great job. Bernie Sanders: I will take on corporations that take their jobs to China. Hillary Clinton: I oppose CAFTA & TPP, but global economy needs trade. Bernie Sanders: Establishment candidates are beholden to big money. Bernie Sanders: Congress represents the wealthy; they donate to ensure that. Bernie Sanders: Litmus test for Supreme Court on Citizens United. Bernie Sanders: Overturn Citizens United: America is one person, one vote. Bernie Sanders: Presidency isn't winnable with public financing. Bernie Sanders: GOP loves voter suppression because it lets them win. Bernie Sanders: Other countries cover everyone; why can't we? Bernie Sanders: Health care for 29 million more uninsured. Hillary Clinton: Go from 90% coverage under ObamaCare to 100% coverage. Bernie Sanders: It does us no good to NOT talk to adversaries. Bernie Sanders: Supports path to citizenship for illegals. Bernie Sanders: It is not unrealistic to fight for middle class. Bernie Sanders: I walk the walk of progressivism, with no Super PAC. Bernie Sanders: I am longest serving Independent but caucus with Dems. Bernie Sanders: Too late for establishment politics: we need a revolution. Hillary Clinton: I am a progressive who gets things done. Hillary Clinton: A woman president does not exemplify the establishment. Hillary Clinton: Speaking fees & donations do not equal political corruption. Hillary Clinton: Before it was emails, it was Benghazi; it's all a ploy. Bernie Sanders: End loophole that allows zero taxes via Cayman Islands. Hillary Clinton: Retroactive classification can make any email problematic. Bernie Sanders: Iraq war led to ISIS creation, as I predicted would happen. Hillary Clinton: Don't normalize relations with Iran; we need leverage. Hillary Clinton: 4,000 U.S. trainers & special forces in Iraq & Syria. 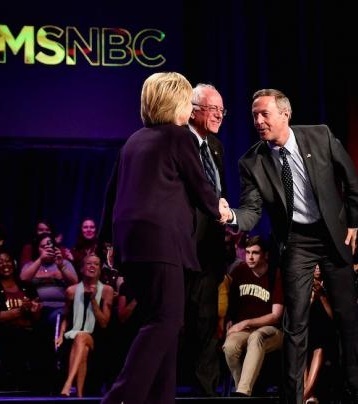 The above quotations are from MSNBC Democratic primary debate in New Hampshire.